The EU is on track to meet its 2020 climate and energy targets. Official data for 2015 show that GHG emissions have already decreased beyond the 20 % reduction target; the use of energy from renewable sources is steadily growing and getting closer to the 20 % target; energy consumption levels are currently considered on track, but are increasing slightly, which means that Member States need to make greater efforts to keep the EU on track towards its energy efficiency target. Approximated GHG emissions for 2016 ('proxy') from Member States and the EEA show a slight decrease compared with 2015. Proxy GHG emissions are therefore 23 % below 1990 levels. In 2016, GHG emissions from stationary installations under the EU ETS decreased by 27 % compared with 2005 levels, while the emissions across sectors covered under the ESD decreased by an estimated 11 %. With proxy estimates for 2016, the EU-wide share of renewables in gross final energy consumption still increased, enabling the EU to be on track towards its 2020 objective. However, energy consumption showed an increase for two consecutive years, triggered by higher heat demand by households following slightly colder winter conditions in Europe as well as an increased activity in the transport sector. The progress in the transport sector remains insufficient in terms of achieving the 10 % sectoral target for RES for 2020. Although the EU as a whole is on track for 2020, the situation differs across individual countries. In 2015, 27 Member States met their annual emission targets for GHG emissions (covering national emissions from sectors governed by the ESD). Malta has failed to reduce its GHG emissions to below its annual emission targets under the ESD since 2013. Twenty-five Member States met or exceeded their indicative trajectories under the Renewable Energy Directive; France, Luxembourg and the Netherlands remained below their trajectory. Twenty-three Member States were below their energy efficiency trajectory; Bulgaria, Estonia, France, Germany and the Netherlands were not making enough progress and exceeded the linear trajectory for primary energy consumption. A total of 17 Member States delivered on their national targets in all three areas in 2015. This number stays constant in 2016, according to approximated EEA estimates. Although the EU is expected to achieve its 2020 targets, achieving more ambitious longer term objectives requires current efforts to be stepped up. Member States and the European Parliament are currently discussing policy proposals for the period 2021-2030 in order to achieve the EU's international commitment under the Paris Agreement. These proposals include a revision of the EU ETS, a proposed Effort Sharing Regulation setting binding national emission targets on sectors outside the ETS, the integration of land use and forestry in the policy framework, the recast of the Renewable Energy and the Energy Efficiency Directives, and a proposal for a governance framework for the Energy Union. Once adopted, these new policies and measures will require timely and effective actions at national level. In the absence of binding national targets for energy efficiency improvements and renewables in the post-2020 period, policy implementation and effects will have to be regularly monitored and evaluated at both EU and national levels. This is planned, in particular, in the context of the new governance for the EU's Energy Union, in order to ensure that these policies and measures adequately support the transition to a low-carbon and competitive EU economy. 1.1 Progress of the European Union towards its '20-20-20' climate and energy targets. 1.2 Progress towards the European Union’s mid- and long-term climate and energy objectives. 1.3 Towards an integrated governance of climate and energy policies in the European Union. 1.4 Progress of Member States towards national 2020 climate and energy objectives. Based on the analysis of data and information reported by Member States in 2017, as well as additional estimates from the EEA, the EU is on course to meet each of its 2020 targets for GHG emissions, renewable energy and energy efficiency. In fact, the GHG target was already surpassed in 2014 (see Figure 1.1). In 2015, the EU achieved a reduction of GHG emissions of 22 % below 1990 levels. This reduction exceeds the 20 % reduction target set for 2020. Emissions in 2015 slightly increased compared with 2014, following an exceptionally warm year in almost all parts of Europe that resulted in a markedly low need for heating. Approximated estimates for emissions in 2016 show a decrease back to the level of 2014. Further details are discussed in Chapter 2. The steady deployment of RES in the EU's energy mix continues. The use of renewable energy continued to increase, standing at 16.7 % of gross final energy consumption in 2015 and getting closer to the 20 % target for 2020. This 2015 RES share is higher than the indicative average level for the years 2015 and 2016 as required by the Renewable Energy Directive (RED). In fact, early EEA estimates for 2016 indicate that the use of energy from renewable sources continued to increase, reaching 16.9 % of gross final energy consumption. The 2020 target could be attained if Member States sustain the pace at which they have deployed renewables so far. However, as we approach 2020, the trajectories for meeting the national targets are becoming steeper, while market barriers still persist in several Member States. Further details are discussed in Chapter 4. Over the past decade, the trend in the EU's primary energy consumption has been decreasing at a pace that, if sustained until 2020, would be sufficient for the EU to meet its 20 % primary energy target. However, recent increases in primary energy consumption in 2014 and 2015, together with an update of the national indicative target in some MS in their 2017 National Energy Efficiency Action Plans (NEEAPs), makes the achievement of the EU 2020 target uncertain . Final energy consumption has been below the 2020 target since 2014, but in 2015 the gap narrowed significantly. Based upon the EEA's approximated estimates for 2016, primary and final energy consumption increased further. This means that, for the EU to remain on track towards its energy efficiency objectives, Member States must reinforce the implementation of current legislation and step up efforts to keep energy consumption in check. Further details are discussed in Chapters 6 and 7. Sources: Council of the European Union, 2007; EC, 2013c; EEA, 2011, 2017a, 2017b, 2017c, 2017d; EU, 2009d, 2012; Eurostat, 2017b, 2017c, 2017d. Although the EU and its Member States are making good progress towards their short-term goals on climate and energy, efforts will need to be considerably increased to meet the EU's long-term goal. For 2050, EU leaders have endorsed the objective of reducing Europe's GHG emissions by 80-95 % compared with 1990 levels, to contribute in a fair manner to limiting climate change and holding global warming to below 2 °C . It includes a binding target of at least a 40 % reduction in domestic GHG emissions, compared with 1990 levels, with individual targets at the Member State level for emissions not covered by the EU ETS; this target has been communicated to the United Nations Framework Convention on Climate Change (UNFCCC) as the Nationally Determined Contribution (NDC) of the EU and its Member States under the Paris Agreement. The target is split into a 43 % reduction in sectors covered under the EU ETS and a 30 % reduction in the sectors covered under the Effort Sharing legislation compared with 2005. It also includes a target to increase, at EU level, the share of RESs to at least 27 % of final energy consumption by 2030; this target is binding at EU level, but there are no fixed targets for individual Member States. Finally, it includes an indicative target at EU level of at least a 27 % improvement in energy efficiency in 2030 compared with projections of energy consumption (based on the European Commission's 2007 Energy Baseline Scenario (EC, 2008)). In June 2017, the European Council endorsed a 30 % energy efficiency target for 2030 (European Council, 2017). This target is equivalent to a reduction of primary energy consumption of about 23 % compared with 2005 consumption levels. For final energy consumption, the 2030 target would be equivalent to a 17 % decrease from 2005 consumption levels. At the time of writing negotiations are still ongoing. According to Member States' projections reported in 2017, a reduction of EU GHG emissions of between 30 % (on the basis of existing mitigation measures) and 32 % (accounting for planned mitigation measures) could be achieved by 2030, compared with 1990 levels. These projected reductions fall short of the 40 % target for 2030, in the sectors under both the EU ETS and the ESD. According to these 2017 projections, future cuts in national GHG emissions will take place mainly in the sectors covered by the ETS (between 35 % and 42 %, compared with 2005 levels), while in the sectors covered by the Effort Sharing legislation the projected reductions for 2030 are somewhat smaller (between 20 % and 22 %, compared with 2005 levels). Maintaining the current pace of RES deployment across Europe would enable the EU to achieve a RES consumption level above the target of 27 % of final energy consumption in 2030. So far, the EU has steadily increased the contribution of RES to gross final energy consumption, thanks to dedicated national support schemes and significant cost reductions achieved by some renewable energy technologies. Nevertheless, in the early 2010s, changes to support mechanisms for renewables, in particular cuts in feed-in tariffs in some Member States that were sometimes even applied retroactively, led to uncertainty on the market and may have caused some investors to hold back. Further action may be necessary to ensure that the EU meets its 2030 RES target. Good progress towards the energy efficiency targets took place between 2005 and 2014, but the pace has slowed in recent years, increasing the uncertainty around the EU meeting its 2020 energy efficiency objectives and, even more so, the target for 2030. Meeting the 2030 target for energy efficiency in the EU will require Member States to strengthen their efforts to keep energy consumption in check, particularly if current economic growth continues, and be steadfast in implementing relevant policies and measures in an adequate and timely manner. Even if the 2030 EU targets were met, efforts would still need to be further enhanced in view of the EU's energy and decarbonisation objectives for 2050. After 2030, GHG emissions would need to decline at a much faster pace than anticipated today to reach the 2050 long-term goal, and renewable energy would need to grow even faster before 2050 to attain the minimum levels consistent with the EU's long-term decarbonisation objectives. The 2030 targets for climate, RES and energy efficiency, introduced with the EU's 2030 climate and energy policy framework, are an important part of the Energy Union Strategy and can be found under the decarbonisation pillar (2030 targets for climate and renewables) and energy efficiency (2030 target for energy efficiency improvements). Progress towards the Energy Union objectives is monitored annually through the European Commission's State of the Energy Union reports (EC, 2015e). In November 2016, the European Commission also tabled a legislative proposal aiming to set up a reliable and transparent governance system for the Energy Union and to help ensure that the Union meets its climate and energy goals. The governance system rests on existing building blocks, such as the national climate programmes developed through EU legislation and aligned with the Paris Agreement, and the national plans for renewable energy and energy efficiency, developed under EU energy legislation. Furthermore, the Energy Governance proposal (EC, 2016h) specifically aims to streamline the existing planning, reporting and monitoring obligations of Member States to ensure coherence and adequacy of policies and measures at European Union, regional and national levels. This streamlining effort is expected to ensure the availability of integrated and coherent national plans comprising data and information and integrated projections on GHG efficiency. This includes projections, as well as anticipated and realised effects of policies and measures. Such information will, in turn, improve the robustness of the assessment of progress towards the climate and energy targets presented in this report. It is expected that Member States will provide finalised integrated climate and energy plans by 2019. Not all Member States are performing well with respect to their national 2020 targets (see Table 1.1). However, the projected overachievements of the majority of Member States offset the slower progress projected in a few Member States. In 2015, all Member States, with the exception of Malta, met their annual GHG emission targets set under the ESD. Malta needs to ensure its compliance with the ESD through the flexibility mechanisms, such as buying annual emission allowances from Member States that have overachieved their targets. According to approximated estimates for 2016, four Member States (Belgium, Finland, Ireland and Malta) might have higher ESD emissions than their annual ESD targets. Following the latest GHG projections submitted in 2017, a total of 21 Member States project that they will meet their national GHG targets in 2020 with the current set of policies and measures in place. The other Member States will have to implement additional measures to reach targets domestically or use the flexibility mechanisms provided under the ESD. Austria, Belgium, Finland, Germany and Luxembourg can comply under the ESD with the transfer of annual emission allowances over time, while Ireland and Malta will need to make use of the opportunity to buy annual emission allowances from other Member States, if emissions develop as projected. Further details are provided in Chapter 3. A total of 25 Member States were making good progress towards their national renewable energy targets for 2015-2016 set in accordance with the RED. France, Luxembourg and the Netherlands were behind their indicative trajectories set for the period 2015-2016. The situation is expected to remain unchanged in 2016, according to the EEA proxy estimates and last year's trend. Further details of this are discussed in Chapter 5. 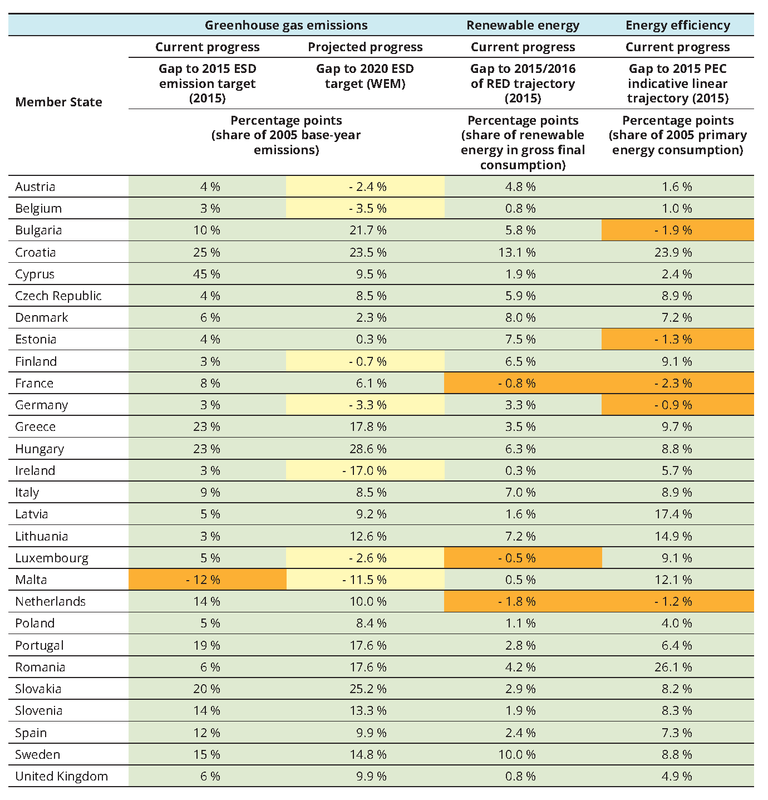 All but five Member States (Bulgaria, Estonia, France, Germany and the Netherlands) were making good progress towards indicative national targets on primary energy consumption in 2015. However, as primary consumption increased across Europe in 2016, according to EEA proxy estimates, three additional countries (Austria, Belgium and Cyprus) will have to reduce energy consumption even faster in the coming years to reach their 2020 targets, while Estonia seems to have reduced primary energy consumption below the linear trajectory to 2020. Further details are provided in Chapter 7. In total, 17 Member States (Croatia, Cyprus, the Czech Republic, Denmark, Greece, Hungary, Italy, Latvia, Lithuania, Poland, Portugal, Romania, Slovakia, Slovenia, Spain, Sweden and the United Kingdom) are considered on track in 2015 to meet all three of their national climate and energy targets for 2020  (see Table 1.1). Austria, Belgium, Bulgaria, Estonia, Finland, France, Germany, Ireland, Luxembourg, Malta and the Netherlands are considered not on track in 2015 in at least one of the three policy domains.However, based on approximated estimates for 2016, only one Member State (Cyprus) will not remain on track, while Estonia will become on track due to decreased primary energy consumption. No Member State underperformed in all three domains. Strong links exist between energy efficiency improvements, the deployment of renewable energy and reductions in GHG emissions. Some of the GHG emission savings resulting from better energy efficiency and more renewable energy use lead to reductions in industrial sectors falling under the EU ETS, such as when renewable electricity is generated and used (EEA 2017j, forthcoming). Other GHG emission savings contribute primarily to Member States' progress towards their national targets under the ESD, relating only to sectors that are not covered under the EU ETS. This is particularly the case for renewable and energy efficiency policies in the transport and buildings sectors, where energy efficiency improvements and the development of RES have played roles of varying importance from one Member State to another with regard to making progress towards national ESD targets (EEA, 2016). With the EU-level 20 % GHG reduction target accounting both for national achievements and for reductions under the EU ETS, the interactions between GHG emissions, renewable energy and energy efficiency targets are strongest at EU level. Notes: The percentage values in this table represent the difference between the parameter considered and the relevant target or indicative trajectory. A positive value indicates that a target is met. Further methodological details on how progress is measured are provided in Annexes 1, 2 and 3. Sources: National information reported by Member States to the EEA, the European Commission and Eurostat. Approximated estimates for the year 2016 were not considered in this table. See Chapters 3, 5 and 7 for further details, as well as Annexes 1, 2 and 3 for information on data and methodology. For references, please go to https://www.eea.europa.eu/themes/climate/trends-and-projections-in-europe/trends-and-projections-in-europe-2017/overall-progress-towards-the-european or scan the QR code.